On the Search Result window, there is a button at the top of the Refine Search panel called "Display Query." Display Query shows you the flattened query. A flattened query includes the code that is actually sent to the search engine based on selections you've made in the User Interface (UI). Let's you review exactly what is being sent to the search engine. In other words, Display Query shows you how the UI impacts the query. 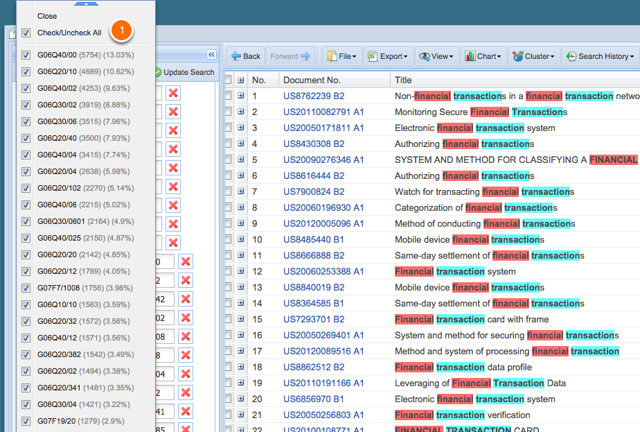 It is helpful for advanced users to diagnose queries and analyze what the UI is doing. By extension, you can edit default behavior of the user interface by choose Display Query, flattening the query, then editing the result. This second option allows you to, for example, use a Boolean NOT and remove selections, and effectively page the facets in each of the filters. By default, AcclaimIP will show you the first 50 facets in each filter. So how can you see the next 50? It only takes a couple of seconds if you use the Display Query button. 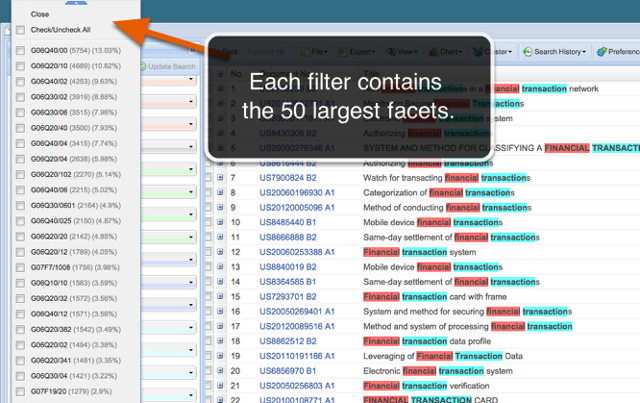 Each filter has the option to Check or Uncheck all facets inside the filter (1). First 50 Facets will be Selected. 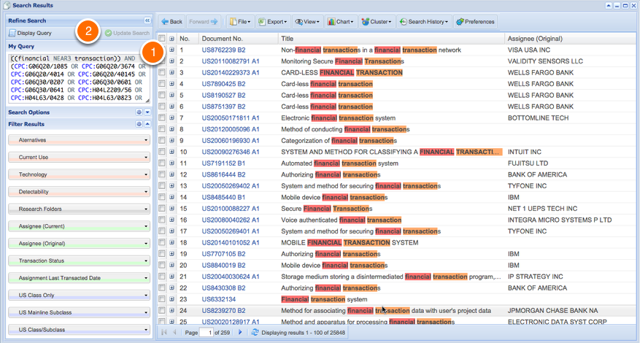 Once the first 50 facets are selected, choose the Display Query button. 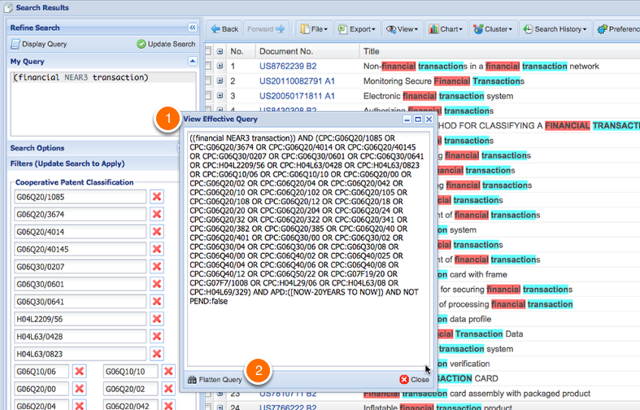 AcclaimIP now shows you the query that is sent to the search engine in the View Effective Query dialog window (1). At the bottom of the View Effective Query dialog box, there is an button called "Flatten Query" (2) which executes the effective flattened query in a new Search Result window, without the filters in the UI and the query in the My Query window. Click the Flatten Query button. Now you can change the Boolean AND (1) in the My Query window, which Requires that the patents be classified in these first 50 classes, to a Boolean NOT which will exclude them. As soon as you modify the query in the My Query window, the Update Search button will become active. The first 50 classes will be removed from your search results, and you'll see classes in facet 51 through 100 in your search results. You can iterate this step to find the next 50 as many times as you wish.